Mitsubishi construisit le tank, et Maedo Koken Kogyo les ailes et l'empennage. Histoire résumée The Maeda Aircraft Corporation created the Ku-6. Maeda was designed by The Aeronautical Institute of the Imperial University in Tokyo. It was designed with all the requirements that the Army’s Troop Transport Command needed. The main problem that the army faced was the difficulty of moving armored fighting vehicles long distances over the main islands of Japan to resist seaborne invasion.They came up with the idea that it could be done by equipping the vehicle with wings, empennage, and take-off carriages. Once landed, all the items that needed to make the vehicle airborne would be quickly detached to allow it to go into action as a ground vehicle. 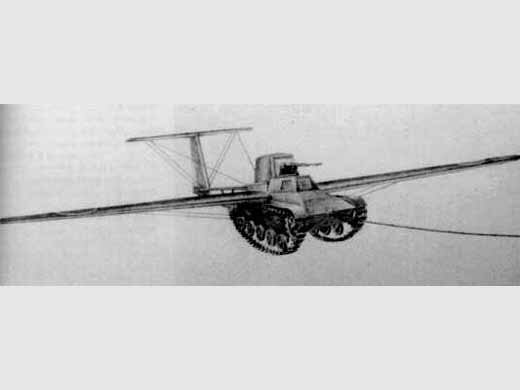 In 1939, the Japanese Amy Air Force Examination Department began the Special Tank Project Number 3 that was given the name Sora-Sha (“air vehicle”). Later it became Kuro-Sha which means “black vehicle”. 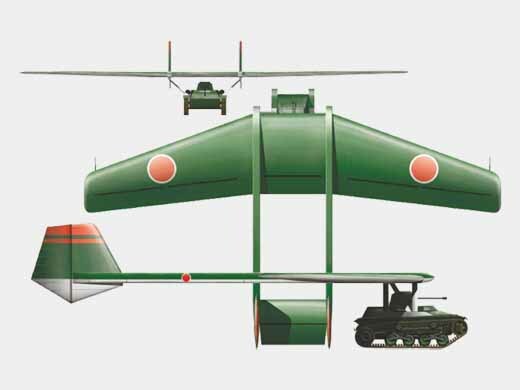 The kuro-Sha became the Ku-6, its gliding series. While Mitsubishi built the special tank, Maedo Koken Kogyo constructed the wing and emennange. Maeda completed the prototype in January 1945. The Maeda Ku-6 Sora-Sha was a Japanese gliding tank intended to be deployed alongside airborne troops. Mitsubishi produced a special streamlined light tank Special Number 3 Light Tank Ku-Ro for the project. The design began in 1939, but was only completed in 1945 with a single glider being produced. Remarques Voir l'Antonov A-40 pour un appareil similaire. par MRAZEK, James E. (1977) [p. 87. Texte + specs].